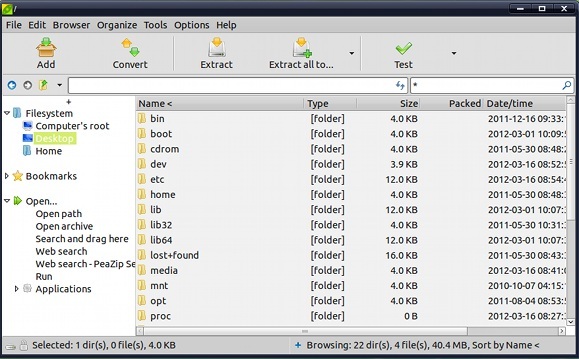 PeaZip is a cross-platform archiver for Linux and Windows sporting a good-looking GUI. If you like GUI-oriented archive programs such as WinZip or 7-Zip, then you will feel at home with PeaZip. Both 32-bit and 64-bit versions of PeaZip are available for 32-bit and 64-bit Linux and Windows. PeaZip is not available in the Ubuntu repository, so you will need to download it from the PeaZip web site. For Ubuntu (64-bit) using Gnome, download the DEB (all) version. A Qt version is also available for KDE. Once downloaded, run the .deb package file locally (not remotely) to install PeaZip. PeaZip will then be available from the main menu at Applications > System Tools > PeaZip. If the PeaZip menu does not appear, either enable it manually (right-click the Main Menu and choose Edit Menus) or log out and log back in. PeaZip is self-explanatory if you are already familiar with GUI archivers, and an excellent, well-written 40-page help manual is included (Help > PeaZip Help). PeaZip is free and fully functional. Feel free to explore!